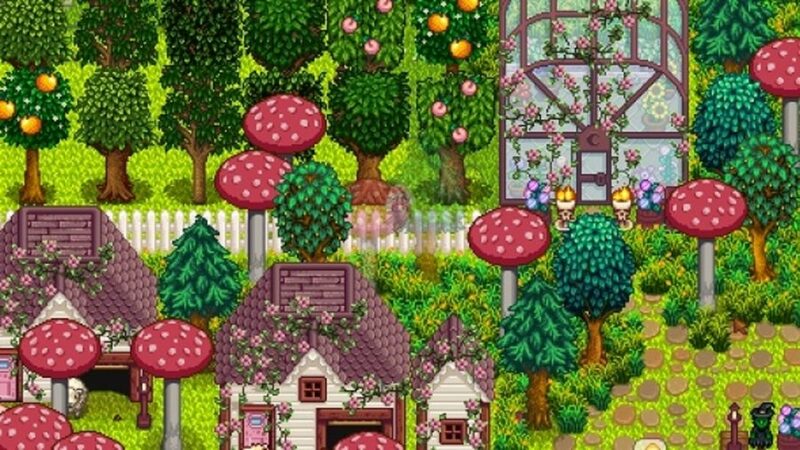 Stardew Valley’s mod scene has been thriving on PC despite it having no official Steam Workshop support. Dedicated modders have been working to alter just about everything available in the game, from adding game-breaking cheats like god mode, to visual overhauls that turn Stardew Valley into a pixelated fairytale. 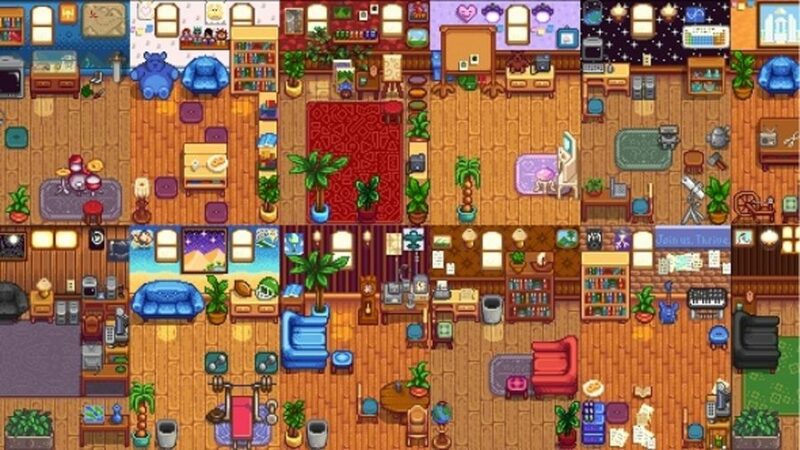 We’ve compiled our favourite Stardew Valley mods that celebrate the creativity of the modding scene, with a selection of mods that provide visual overhauls, gameplay changes, and yes, even some cheats. As Stardew Valley does not have any Steam Workshop support, getting mods working requires you to change the game’s internal files. Therefore, for peace of mind, we highly recommend backing up all your files – especially your save files – before downloading and installing any mods. As Stardew Valley is a game that still receives regular updates, it is possible that a future update will break any existing mods you have installed. Just bear that in mind. 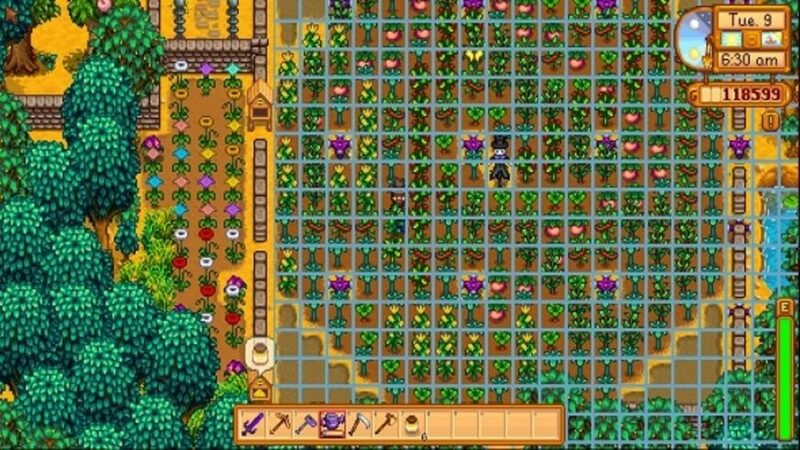 Adding mods to Stardew Valley isn’t too taxing even without Steam Workshop. There are two primary types of mods in Stardew Valley: mods that replace existing XNB files in the content folder, and mods that require the ‘Stardew Modding API’, or SMAPI for short, to install. 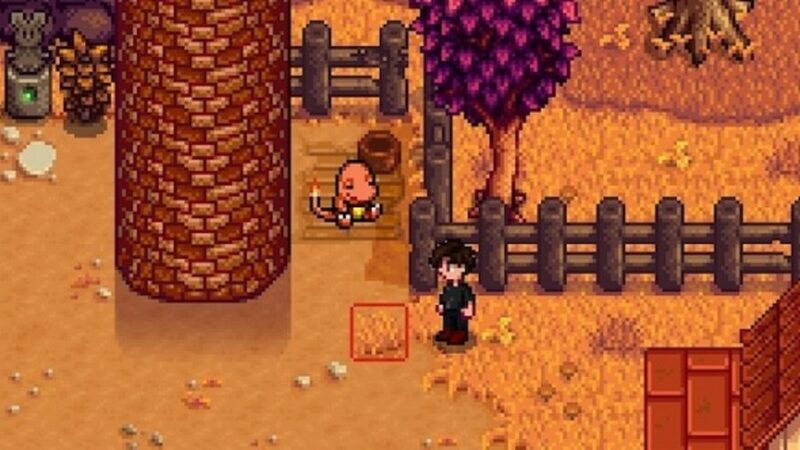 Most Stardew Valley mods make small changes to the game such as altering visuals and reskinning assets. To install, these require you to replace the existing XNB file with a new, modified version. Once you’ve downloaded your XNB mod file, which, for example, may be named ‘cat.XNB’, you will need to find the corresponding XNB file in the Stardew Valley content folder. By default, the Stardew Valley content folder is located here: C:/Steam/steamapps/common/Stardew Valley/Content. 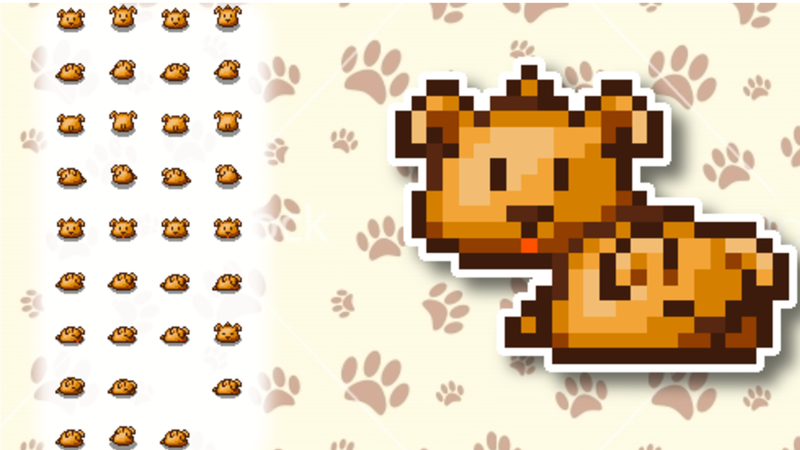 There are several subfolders in the content folder, with most of the important assets, including animals and villagers, having their own, making them easy to find. With our new ‘cat.XNB’ file, you will need to go into the ‘Animals’ subfolder and replace the existing ‘cat.xnb’ file with our new modded file, which will then show up in game the next time it is booted. As a reminder, we recommend that you keep any unmodded files backed up, should you ever wish to uninstall a mod. Content Patcher is a mod for SMAPI that allows you to download content packs, which can change the game’s visuals or assets like XNB mods, but without requiring you to manually alter the XNB files. This is a much more reliable way of installing mods than replacing XNB files, as they can be automatically updated, installed, and uninstalled through SMAPI. Most XNB file mods have content pack equivalents. For mods that make larger changes to the game, such as altering events, SMAPI is required for installation. It is an open source piece of software that is maintained by the Stardew Valley modding community that allows for the installation of DLL files SMAPI can also help to manage your files by checking when your mods have received a new update, as well as rewrite any installed mods when an official Stardew Valley update changes any part of the game that affects your mods. Once you have installed SMAPI, all you have to do is place your files into the SMAPI mod folder, and you should be good to go. 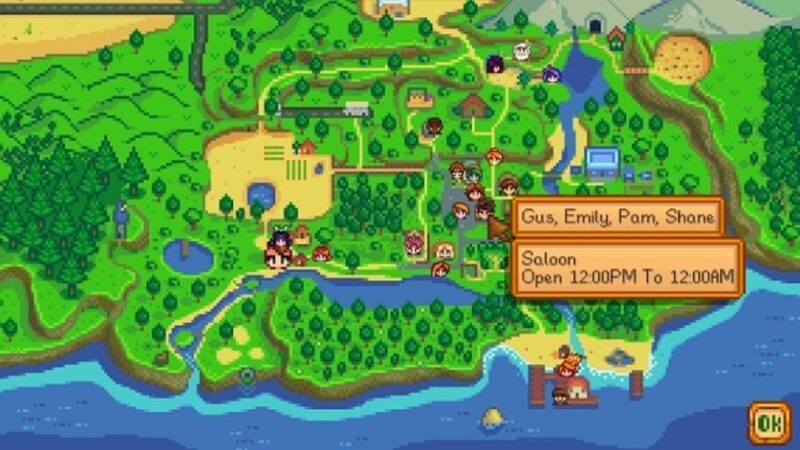 If you like to keep your mods neat and organised, modder Yuuki has made a fantastic tool called the Stardew Valley Mod Manager, or SDVMM for short. This allows you to keep track of all your mods and manage SMAPI. Its best feature is giving you the ability to turn mods on or off without deleting the files, which is useful if you, like us, are incredibly indecisive or have half a dozen different grass mods that you are looking to try out. Now, let’s get onto the good stuff – the mods themselves. Let’s kick off this list with the visual mods, these are the mods that change the appearance of Stardew Valley trough redesigns and retextures of features already in the game. Being able to have biological or adopted children with your spouse is a lovely feature in Stardew Valley. This babies and toddlers mod expands on the feature by adding a little more personalisation. Instead of the generic palette, your child inherits features from your spouse, including hair and colour styles. Just a quick note that this mod requires SMAPI and content patcher. 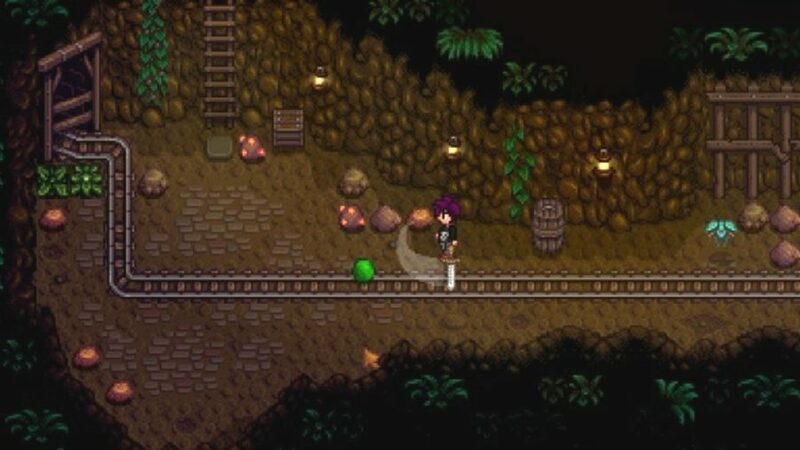 The slimes in Stardew Valley are positively adorable, but unfortunately, you are not able to wrangle them and take up the life of a slime farmer. This lovely slime animal mod can turn all animals that roam your farm – from cats and dogs to livestock – into round oozy forms for your enjoyment, with the sheep even turning into big balls of gooey wool when they are ready to be sheared. You can download the content pack for this mod further down the thread. After you have tied the knot, your spouse will move into your farmhouse with you, bringing with them a new room for their belongings and hobbies. Unfortunately, these rooms don’t feel entirely personal to each character, and are instead filled with generic items. This spouse rooms redesigned mod overhauls each room to give them unique touches for each spouse. Elliot gets a desk and typewriter due to his occupation as an author while Leah receives decorative paintings and art supplies to match her hobbies. It’s a small change, but one that makes Stardew Valley feel much more homely. You can download the content patch here. Nothing is more effective at guarding crops than a host of kitties standing guard in your field. 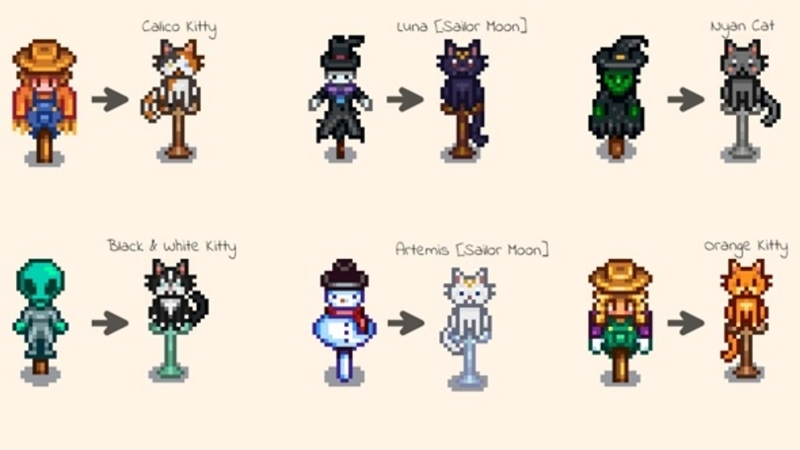 This Stardew Valley scarecrow replacement mod overhauls the regular scarecrow models in game, replacing them with a selection of adorable pixelated cats that will definitely keep the crows at bay. There are eight models to choose from, including meme favourites Nyan Cat and Grumpy Cat, as well as Artemis and Luna from Sailor Moon. A mod that overhauls all the grass on the overworld, Eemie’s Wildflowers turns all regular grass patches into bountiful and vibrant wildflowers that vary with each season. They are so pretty that you’ll feel bad cutting them up for hay. The bath house in Stardew Valley is a bit of an ugly duckling as it looks out of place against the rural vibes of the game. 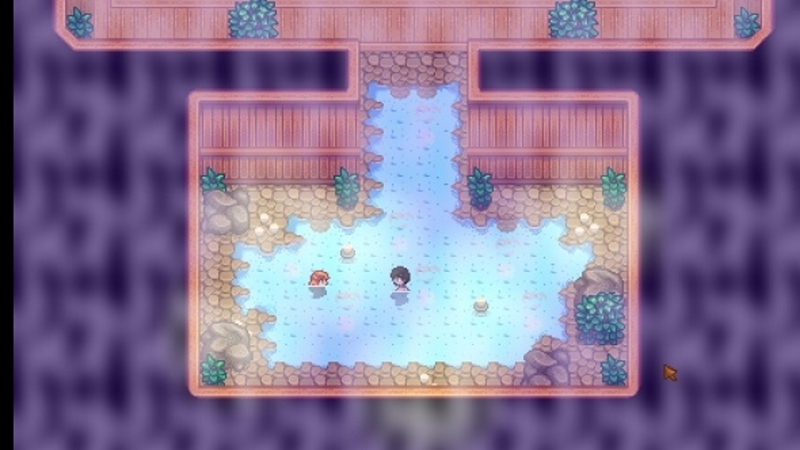 This hot spring mod replaces the bath house with an indoor hot spring, presenting a cute, tranquil experience more in line with the game’s rustic aesthetic. If you are looking to bring a fantasy twist to Stardew Valley then this visual overhaul is a must. This overgrown fairy buildings mod turns all buildings into cute pastel houses that look like they are straight out of a children’s fairytale book, complete with striking flowers crawling up the sides of houses, and giant mushroom trees that give the whole mod a very Alice in Wonderland feel. This simple Stardew Valley map recolour mod brings a more refined and lighter colour palette to the overworld, adding new grass colours and trees to each season to create an overall richer environment. 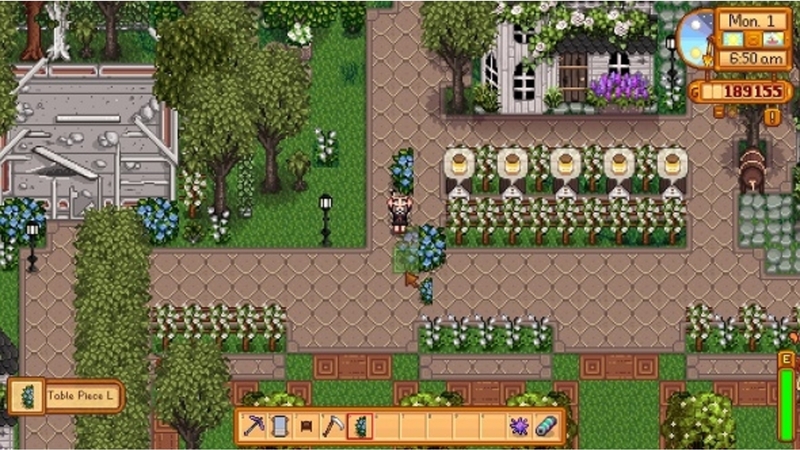 Another visual mod that overhauls the world map, this one adds a Victorian aesthetic to Stardew Valley, turning the regular wooden buildings into white-coloured homesteads with large windows and mossy overgrowth. 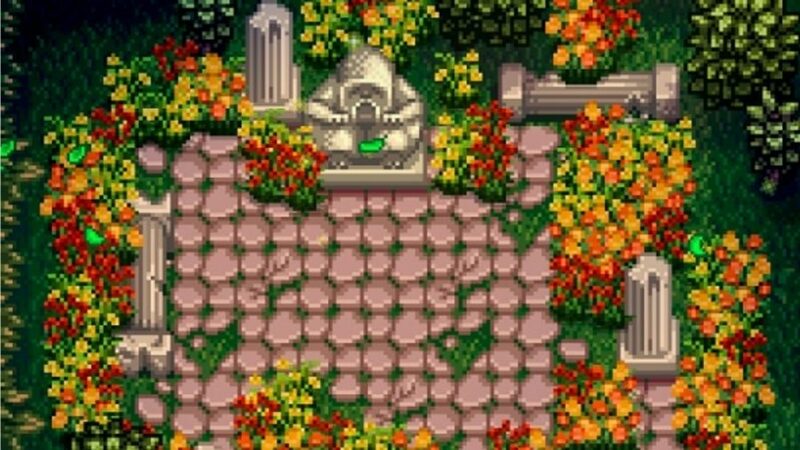 It also adds new flowers, grass, and trees to the overworld, as well as features like snow and fallen leaves that change with each passing season. 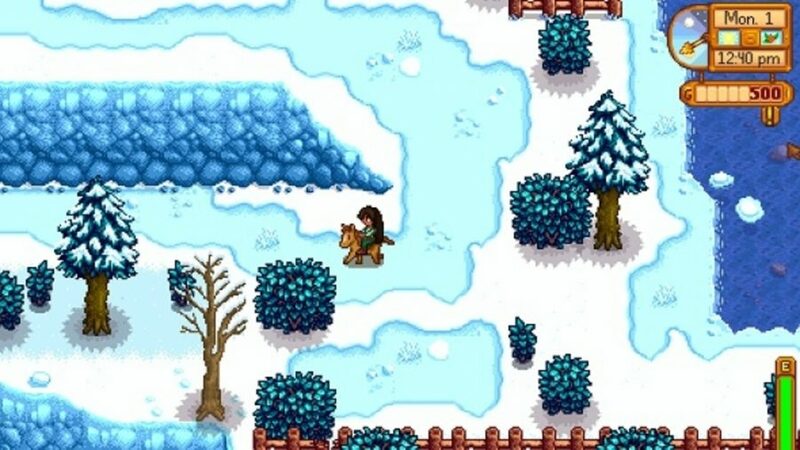 Here are a list of mods that change the way that you play Stardew Valley. Some are small tweaks and other are huge overhauls but all of them will change the way you farm in the future. Just because you’re a farmer that doesn’t mean you can’t take pride in your appearance. 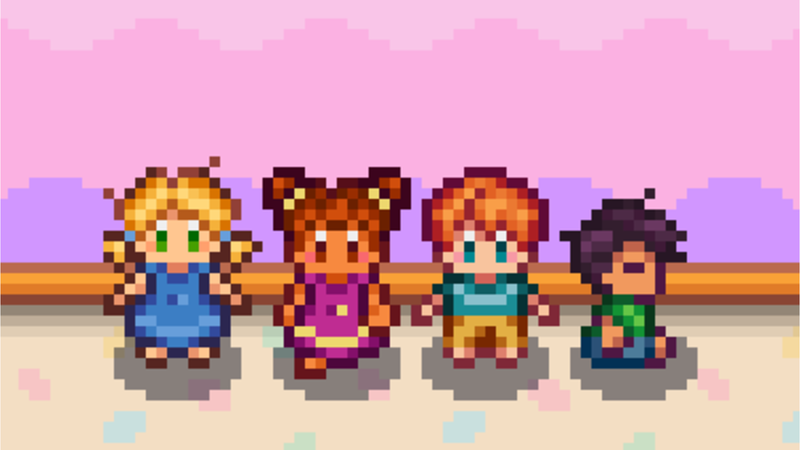 Get Dressed is a great Stardew Valley mod that adds a little bit of realism to your game, because you definitely shouldn’t be wearing the same shirt for hundreds of hours at a time. 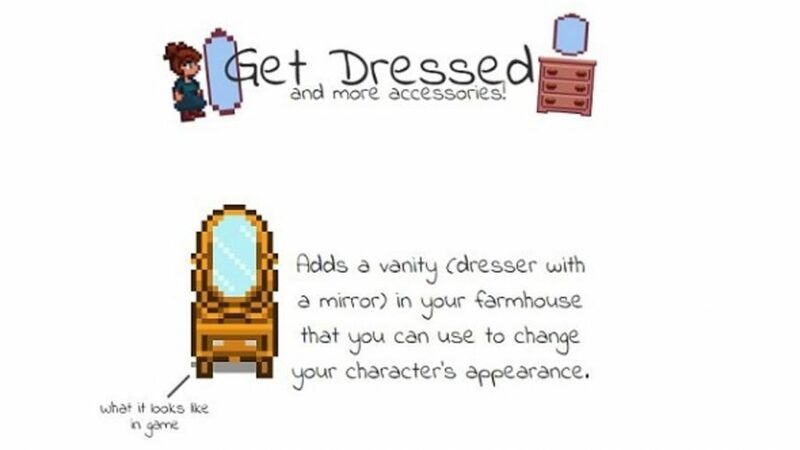 It creates a vanity dresser in your farmhouse that, when used, lets you alter your character’s face, hair, clothing, and even add makeup. Yes, a tuxedo is definitely practical farming attire, shh. Planting seeds, watering crops, and collecting your bountiful crop is a lot of work. But pathoschild’s Tractor mod has made every farmer’s life easier. 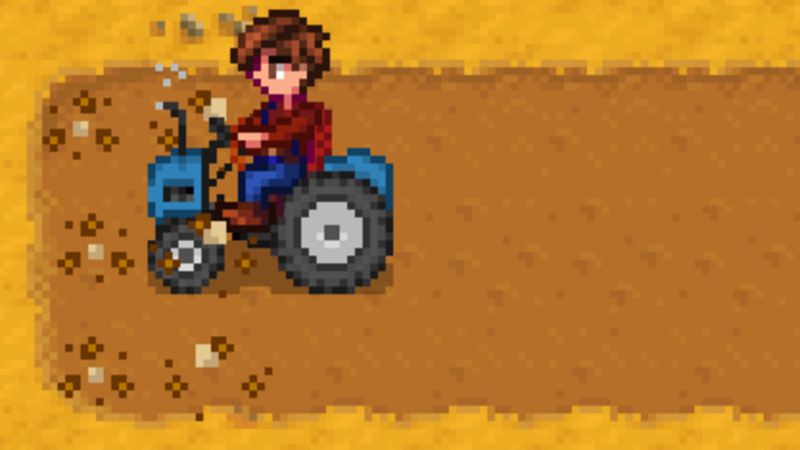 To get the tractor you have to buy the tractor garage from Robin and when she’s done building it you can just hop on and get to work! The tractor is all your tools built into one, it can clear twigs and rocks, fertilise dirt, plant seeds, harvests crops, and waters the ground. If you dive into the config menu of the mod you can even use your tractor to kill monsters, mow them all down! Its tough knowing which animals you have shown love to and which ones you haven’t on your farm. There’s no indication on who you’ve missed out which leads to me double and triple checking that I’ve covered ALL my animals. It’s /very/ important. But much as I love petting the cute animals, I’m on a tight schedule and with jinxiewinxie’s mod Loved Labels you can see which animals you have shown love to that day with a little pop up heart box. There are just so many cute characters in Stardew Valley, why can’t we just date them all! Well now we can with bwdy’s Polygamy mod. 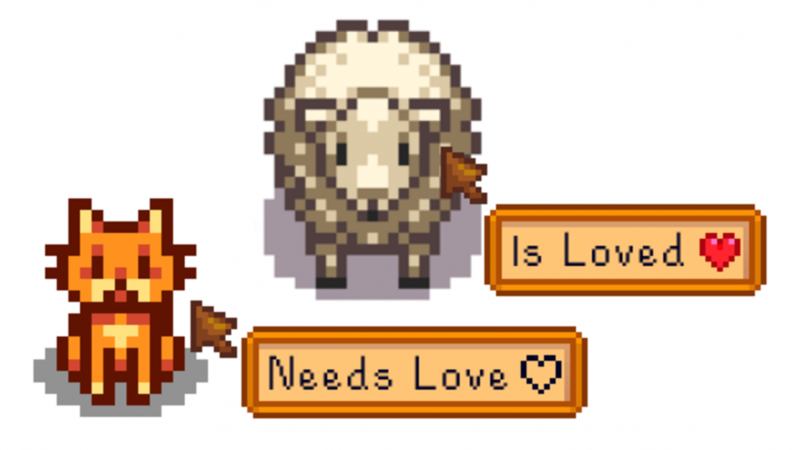 Beyond the excitement of being able to date all the Stardew cuties, it’s also great to see a mod that’s so inclusive of non-monogamous relationships. This mod allows you to marry multiple partners by cycling through a “primary” spouse each day. After your first wedding, Piere will let you purchase additional Mermaid Pendants from his shop and as long as accompany the pendant with the bouquet, your chosen NPC will accept your offer. 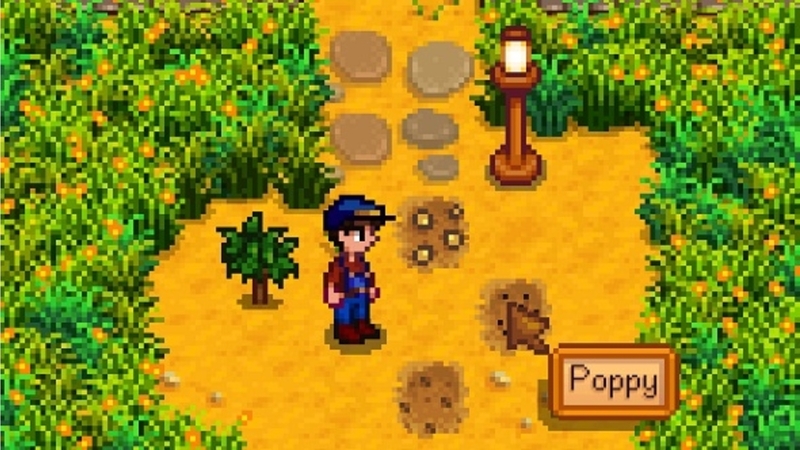 It is easy to pick Stardew Valley up after a break, venture out into your farm, and wonder what on earth it is you have planted in the soil. A small but useful overhaul, the Simple Crop Label mod adds an option for a name tab to appear over a crop once you hover over it with your mouse. 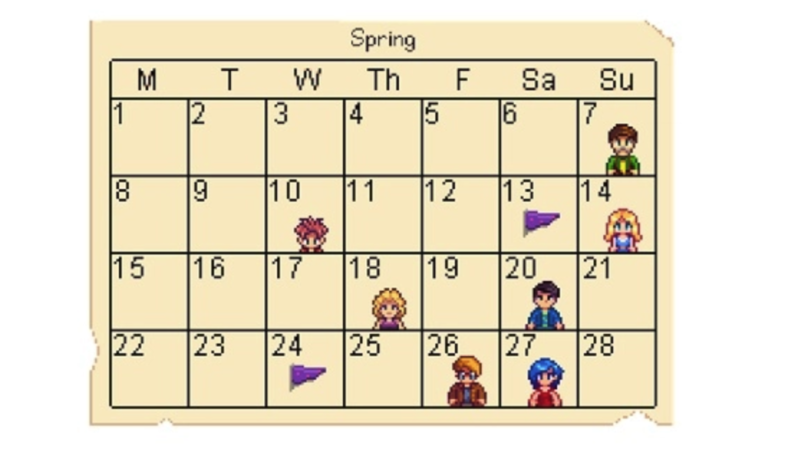 Popping back to Pierre’s or your own farmhouse to check the calendar for events and birthdays can feel like a waste of time – especially when time is so precious in Stardew Valley. This handy calendar mod allows you to view the calendar at anytime by clicking on the day clock in the right-hand corner. Placing scarecrows and sprinklers perfectly on your farm isn’t easy. It is frustrating to wake up to find your precious seedlings have been pinched by crows as the tile is out of range of your scarecrow – we have all been there. This Stardew Valley range display mod displays the effective range of all scarecrows, sprinklers, and bee houses you place on your farm, ensuring your crops are always well watered and protected. With everything it is possible to do in a single day in Stardew Valley, memorising the daily routines of the game’s many characters can feel daunting, especially when many have routines that change depending on the season or weather. With the NPC map locations mod, you can view where each villager is at any time, and can fully customise it to your preferences, which is handy if you’re only looking for the location of a select few characters. 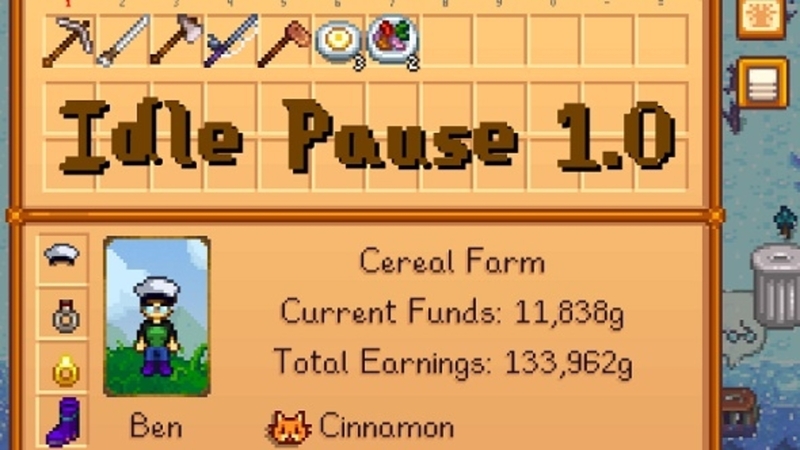 If you consider Stardew Valley to be an outlet for your capitalist desires as your work yourself to the bone, then this show item sell price mod is a must. This mod displays the sell price of all items in your backpack, so if your inventory if full you can easily look at what is worth the least to throw away, or you can use it to look upon all your potential profits in glee before you sell, sell, sell. 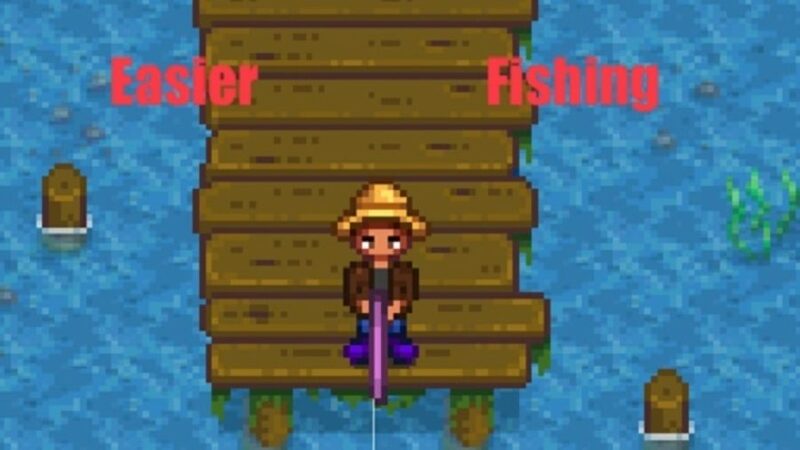 Fish in Stardew Valley are fickle. They will not allow themselves to be caught without making you put some serious work into doing so. The easier fishing mod attempts to alleviate the frustration that comes with this minigame by making the fish movements smoother, and therefore easier to track, and also makes the fish move up and down the meter less swiftly. 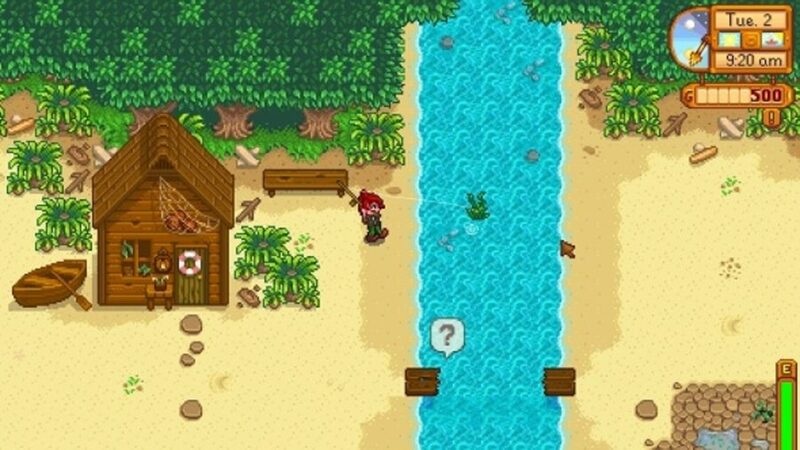 If you find fishing in Stardew Valley annoying then this mod is an essential download. Fences are an aesthetically pleasing piece of garden decoration, on top of being useful for keeping animals and certain crops contained to one part of your farm. The downside, however, is they decay over time, with regular wooden fences only lasting for 30 days before deteriorating. This slower fence decay mod doesn’t override that feature of the game, but it does make it less harsh on you, with fences lasting up to two or three times longer before they need replacing. 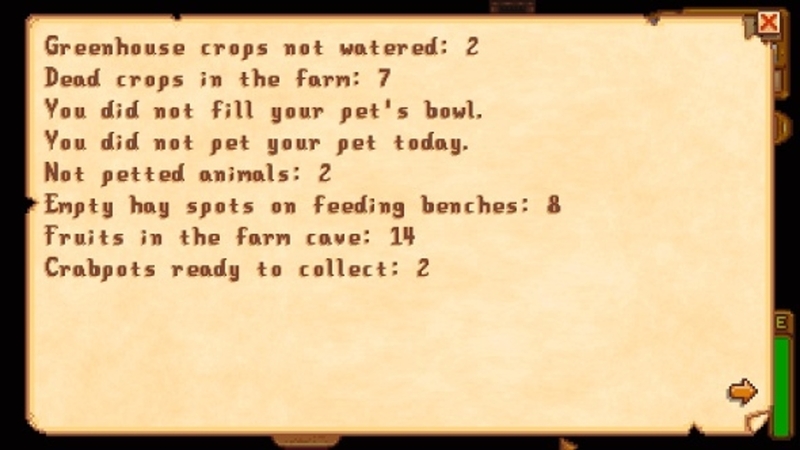 Nothing brings about a wave of dread like forgetting to do a simple yet essential task, such as watering crops or feeding your livestock. This Stardew Valley daily tasks report mod creates a list of daily tasks for you to accomplish each day that you can view with a quick press of a button, and provides handy reminders for events like birthdays, the travelling merchant, and general farm duties. Sometimes we need a little bit of extra help in Stardew Valley and sometimes we need a lot of extra help and these cheats are here for that. As the holy grail of Stardew Valley cheat mods, this CJB cheats one provides you with access to every cheat under the sun, and then some. They range from an unlimited watering can to infinite health and stamina. 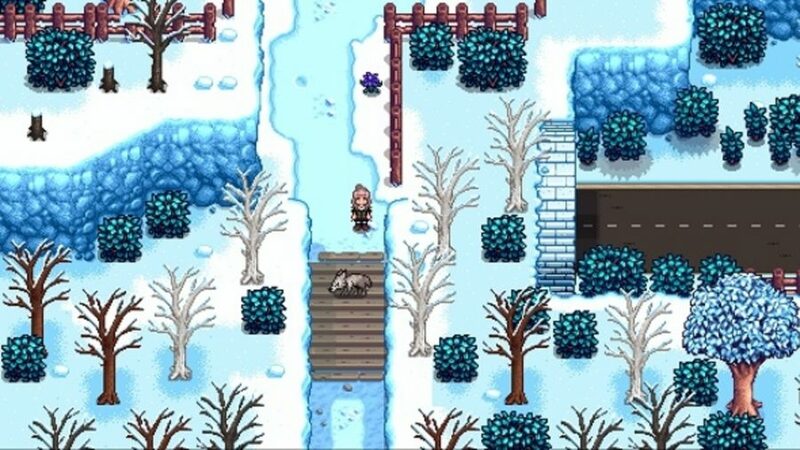 You can also freeze time, adjust your relationships with the villagers, and warp to any location on the map. 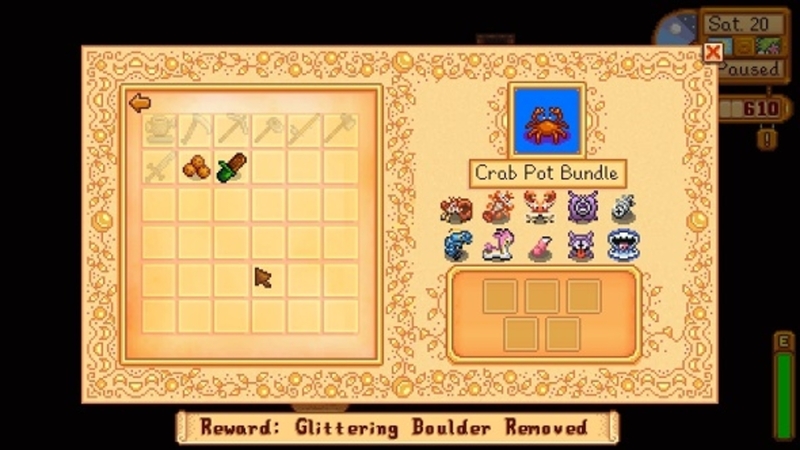 This might be the closest we get to Stardew Valley having a sandbox mode. With great power comes great responsibility, and so you will want to use this item spawner mod wisely, lest you wish to break all the balance in your game. 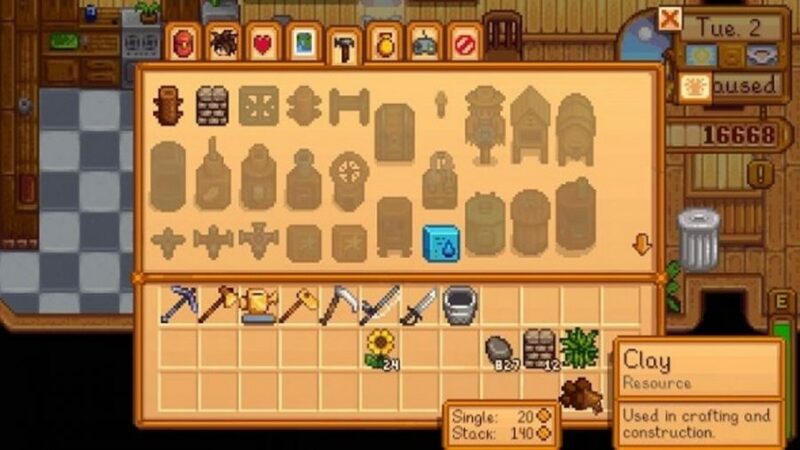 This Stardew Valley Item Spawner mod allows you to conjure any item, at whatever quantity and quality, straight into your inventory. Using this mod can take you from rags to riches in no time at all, or you can put its creative potential to use and build your dream farm without having to endure the dozens of hours it would take otherwise. We have all felt the pain of being deep into a mining session only to realise your inventory is full of the item. Or maybe you have been out trying to impress your favourite villager and the gift you are looking to give them is actually back at home in one of your chests. The Chests Anywhere mod allows you to access your chests, fridge, shipping bin, and Junimo huts from anywhere on the map, so no more pesky trips back to the farm to pick up or drop off items. This is an incredibly handy mod that brings all the knowledge of the wiki to the game itself. The Lookup Anything mod lets you pop up a menu that displays information on whichever item is under your cursor by pressing F1. It provides useful information on everything from villagers and their likes and dislikes, how many days it will take until a crop is ready for harvest, and even explains why your animals are unhappy. 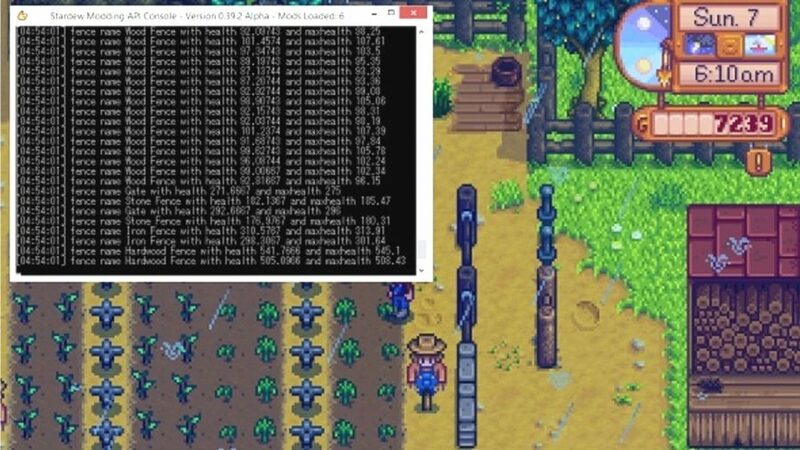 If you, like us, have taken to managing your time on Stardew Valley through spreadsheets, then this mod might be a practical solution to your troubles. As with the cruel sands of time, Stardew Valley pauses for no-one, except, of course, if you cheat. The Idle Pause mod is a helpful utility for the time conscious, as it automatically pauses when it detects more than a few of seconds of idleness, bringing up the inventory to indicate when the in-game timer has stopped ticking. Finally, you can take bathroom breaks again. 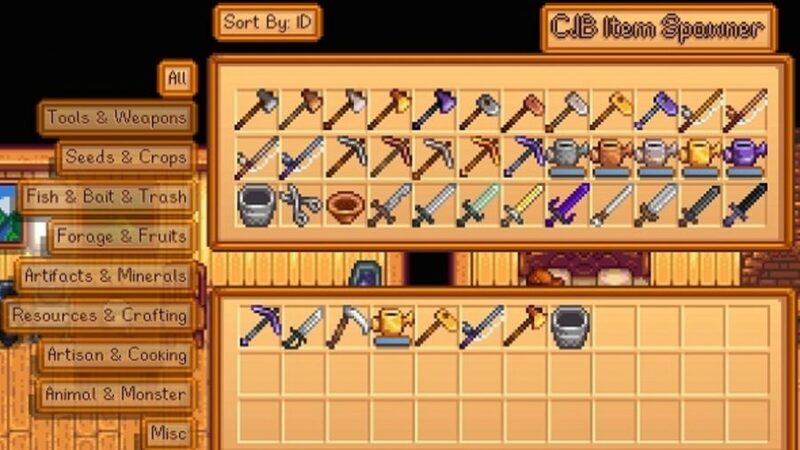 Stamina is a very limited resource in Stardew Valley, and with so much to pack into a day’s work – from farming, to battling your way through the mines – it can feel like you have never got enough of it. The Stamina Regen mod can provide relief for such a setback, allowing you to regain one point of stamina every three seconds, making those mining expeditions a little more productive. Quests are a useful way of acquiring funds and increasing friendship. However, the imposed time limits can be frustrating if they are short, or you’re not far enough into the game to obtain the items needed. 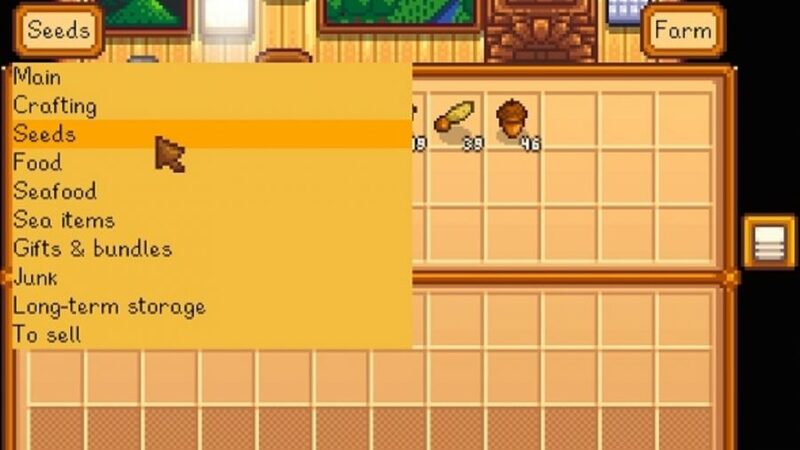 This straightforward Stardew Valley Quest Delay mod removes the time limits from all quests, allowing you to complete them in your own time. A mod that defies nature itself, this cheat allows you to grow and harvest any plant or crop regardless of the season, and does not cause crops to decay when a season changes. Usually, each crop is restricted to being grown in a certain season, with no crops being able to be grown in winter without the use of a greenhouse, but with this All Crops All Seasons mod you’ll be able to grow all the strawberries in the autumn that your heart desires. 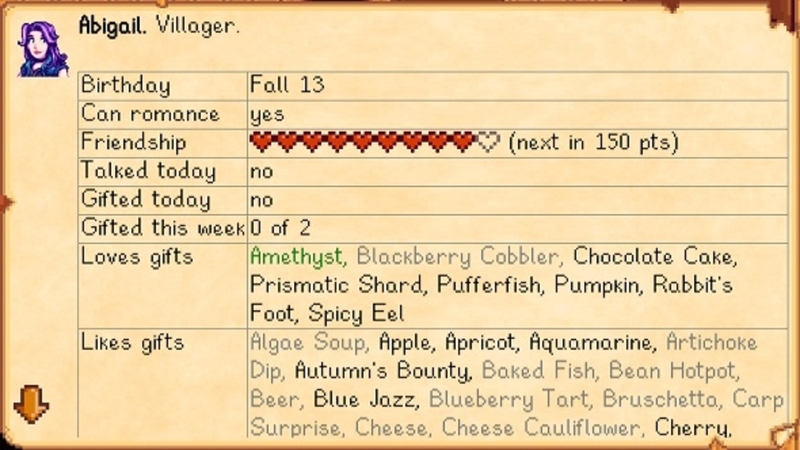 Take note of the fact that this mod does not change store inventory, so you will need to stock up on seeds each season in order to plant them during a later season. Sometimes,It can feel like everything is against you in Stardew Valley, even the clock. 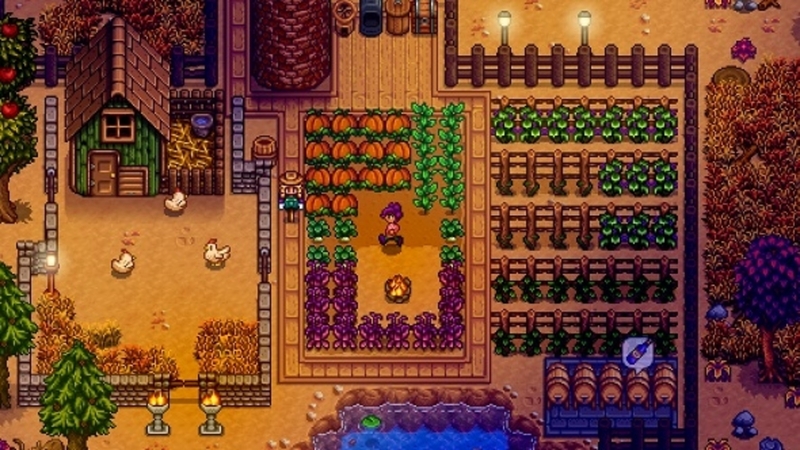 Part of Stardew Valley is learning how to manage your day effectively, choosing to finish a few tasks rather than stretching your time across a lot of jobs. Rather than deal with that stress, this TimeSpeed mod allows you to adjust the amount of time you have each day, doubling the day by default but allowing for customised lengths depending on how much you need. Turns out it is surprisingly easy to misplace a horse, so thank god this Horse Whistle mod exists. Simple in design, this mod allows you to summon your horse, regardless of where you left it, by pressing ‘V’, with the horse teleporting to your location using what we can only assume to be genuine magic. That’s all the mods and cheats we’ve reaped for now and it’s quite the bumper crop. If you’re after more Stardew content check out our guide on how to make money fast in Stardew Valley. Wondered how difficult farming is in the real world without mods and cheats? We asked a Californian farmer about how realistic Stardew Valley is.